Should teen driving licenses be tied to school attendance or grades? Thank you for visiting the Nudge blog. We have moved this post to our new website. This post can now be viewed at: http://nudges.org/2008/09/02/should-teen-driving-licenses-be-tied-to-grades/. We apologize for the inconvenience. When it comes to making government accessible to the public, California is showing itself to be among the leaders in the U.S. First there was Ready Return, and now along comes the equally innovative, although less creatively named, School Finder. The online tool allows people to search and compare up to three neighborhood schools along the dimensions of academic performance, graduation and dropout rates, student-teacher ratios, per-student-spending, and course offerings. Information from as many as three schools can be compared side by side. Compiling all of this data into one site in impressive, although not unique. The U.S. government’s Medicare site features a tool for comparing hospitals that features a surfeit of detail, right down to survey results about whether doctors and nurses “communicated well” with patients. What makes School Finder stand out is its ease-of-use, which may not come as a huge surprise since the state partnered with Google and Microsoft. Users will instantly recognized the Google Earth satellite photos, which are supplemented with Microsoft GIS technology, to help time-pressed, keyboard-averse users easily find and compare schools with the click of a mouse. Patrick Emerson of the Oregon Economics Blog has been thinking about how to handle the huge backlog of maintenance projects for Portland’s public schools. Which projects should Portland Public Schools (PPS) tackle now? Which ones should PPS tackle later? Drawing on the ideas of behavioral economists Matt Rabin and Ted O’Donoghue, Emerson makes the following suggestion. As an economist, intertemporal problems are routine. You have to weigh the present value of the costs and benefits when taking a decision about fixing something today versus letting it go a while longer. This would seem a fairly easy problem for an institution like PPS (though it is in no way an answer to the overriding problem of resource constraints). But the reality is that parents have a time horizon that is much shorter than the school district itself. If a parent knows their child will be in a school for only 5 years, the present discounted value of deferred maintenance cost is much smaller than for PPS itself which is thinking of school buildings lasting for 50 more years. This is true in many aspects of government business – it is often hard to get the public to be far-sighted (especially true when you talk about very long time horizons and add some uncertainty like in global warming). It seems like an appropriate response would be to put some welfare weights on the current concerns of parents and the concerns of future parents and be explicit/transparent about it. Simply deferring maintenance and hoping for better times in the future seems like a fool’s errand. It is likely to never happen and often you end up having to pay a much higher price when systems fail like the heating system at Cleveland. Once we decide how to weight the concerns of the current generation and future generations, we can then start to allocate resources systematically. Why is this a good idea? Because it is often very hard to resist fulfilling urges today – people tend to place undue weight on current needs and desires. Ex post, however, they often regret not having exercised more self-control…In the parlance of (Nudge), my welfare weights idea would be introducing ‘architecture’ to the choices made by the PPS. This architecture acts as a commitment device and will ensure that we are not shortchanging future kids for the sake of the current ones. Instead what we have is a bunch of discretionary decisions that add uncertainty and inefficiency into the system which serves no one well. In the late 1980s, the architectural firm Gruzen Samton Steinglass suggested that the public school system of New York City get rid of a century-old classroom design — the square. There was nothing terribly wrong with the square – it was certainly familiar and cost-efficient to reproduce – the firm concluded, but there were better ways to allow teachers to take advantages of their personalities and learning styles, and to hold student attention when multiple activities might be occurring in the same space. 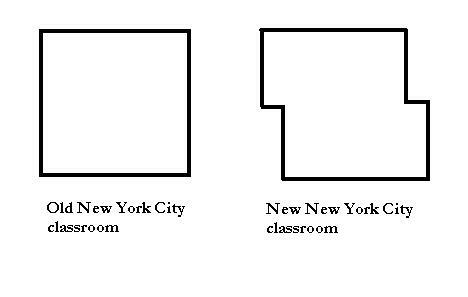 Are there any New York City public school alumni out there who’ve been taught in these classrooms?